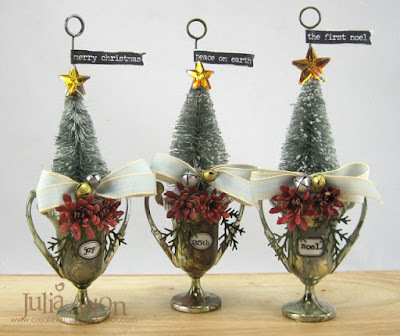 Oh my gosh - did you see these adorable little Festive Trophy Cup Ornaments on Tim Holtz' blog the other day? I flew home from work and started working on some of my own as soon as I got there! 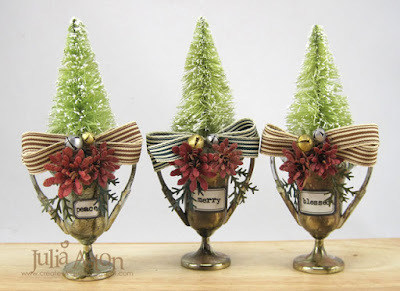 These first 3 are pretty much clones of what Tim did - I used different colors on the trees and trophy cups as I didn't have the ones Tim used and I used Remnant Rubs on the Vial Labels on the trophies instead of stamping on them. 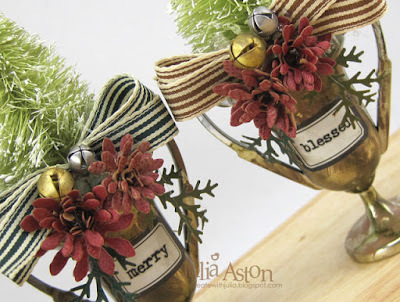 I used Butterscotch Alcohol Ink to color my mirrored stars and pretty much everything was adhered with my glue gun. I just love the Tiny Tattered florals! I used a Martha Stewart punch for the greenery, and Jingle Brads on the ribbons. 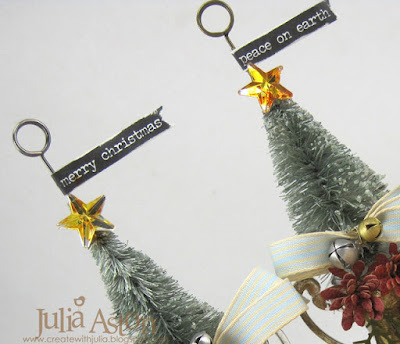 Then I ran out of Mirrored Stars and the right size Ranger trees - but luckily had some trees that came already colored and snowy from Joanns (half price!!) that were pretty much the same size - so I used those. I omitted the Memo Pins and Small Talk Stickers - just decorating the trophies. I love these simpler ones too! 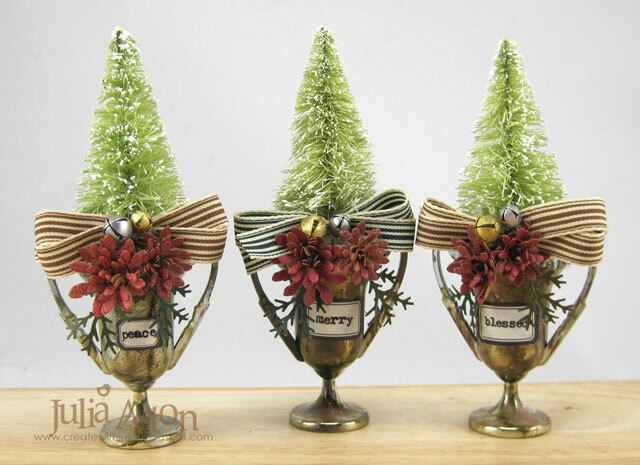 In case you aren't familiar with these Ranger plastic trophy cups, they are about 2 1/8" tall so the whole thing with the tree inside is a mini 4 3/4" - SO CUTE on shelf or mantel! And these last 3 that are less obviously for Christmas can be left out all winter! 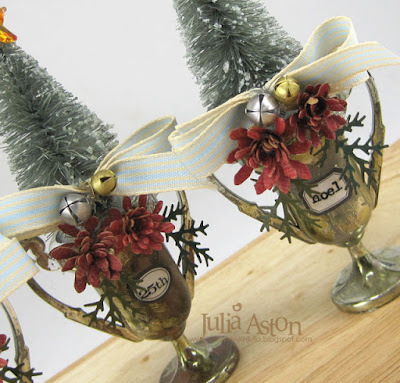 Are you ready for the holidays?! OMG this is totally awesome! These are just so adorable! You are amazing! They're just charming, Julia... It's easy to see you were so inspired by Tim, and how much fun you had making these. Lovely decorative ornaments! How cute are these? So sweet Julia! Merry Christmas! WOW!!! Amazing work Julia! Your creative mind is such a huge inspiration to me!